As a food blogger, the photography portion is not my strong point. I know this. I consider myself to be on the low side of decent. I’m better than many and worse than many. I am at peace with my place in the food photography world. When I have the time and some creative juices are flowing, I may take a picture that is better than decent. But most of the time I am rushing, fighting against the waning light or the ticking of the clock and my husband’s appetite and patience. You might notice that my sweet shots tend to be better than my savory. That is because I can shoot cookies the morning after I have made them and when I don’t have anyone wondering when we are going to be ready to eat already. How is this possible? It’s shallot, a few dried herbs, chickpeas, broth and lemon juice. Oh, but wait. There are also some slow roasted tomatoes and slow roasted cloves of garlic that make an appearance just before serving time and those two things add so much depth, such savory umami-ness, almost creaminess to this dish. I am no stranger to slow-roasted tomatoes or to roasted garlic. But I would never have thought to include them in a chickpea stew and shame! on! me! for not doing this sooner. I think this was originally meant as a side. If you are making it as a main, I would definitely double it, even for 2. Leftovers would be amazing but I wouldn’t know since we didn’t have any. Because I didn’t have enough tomatoes, I added some sun-dried ones as well to bulk my stew up. Don’t be tempted to skip making the oven-dried ones though. Trust me. Finally, I sprinkled a bit of chopped mint over top for color – normally I use parsley but I was out. We both liked the flavor of the mint so that is a keeper step. Place a large saucepan over medium heat. Drizzle in just enough olive oil to coat the bottom, then add the shallot along with a large pinch of salt and cook over moderate heat, stirring, until softened, about 5 minutes. Add the chickpeas, oregano, bay leaf, and crushed red pepper. Cook, stirring frequently, until the herbs are fragrant, about 5 minutes. Add the broth and lemon juice and bring to a boil. Simmer the stew over moderately low heat until the broth is reduced by half, about 20 minutes. Stir in the Oven-Dried Tomatoes and the garlic and simmer for 5 minutes. Discard the bay leaf. Season the stew with salt and serve over with rice or with crusty bread. Garnish with chopped mint. Preheat oven to 250º and position 2 racks just above and just below the middle of the oven. Working over a medium bowl, pry the seeds and pulp out of the tomatoes and discard. Pour ¼ cup of the olive oil onto each of 2 very sturdy, rimmed, light-colored baking sheets. Arrange the tomatoes, cut side down on the baking sheets and scatter the garlic and thyme all around. Make a tiny slit on each tomato. Bake the tomatoes for about 45 minutes, until the skins begin to wrinkle. Shift the pans from top to bottom halfway through. Carefully pinch off the skins. Flip each tomato and bake until the surface looks dry, about 1 hour. Flip the tomatoes again and continue baking until the surfaces look dry but the tomatoes are still slightly plump, about 2 hours longer. Season the tomatoes with salt and pepper and let cool completely. Discard the thyme sprigs and peel the garlic cloves. Layer the tomatoes with the garlic in five ½-pint jars. Add enough olive oil to cover the tomatoes by at least 1 inch. Slide the blade of a knife along the side of each jar to release any air bubbles. Seal the jar and refrigerate for up to 2 months or freeze for up to 6 months. I think it’s hard to photograph pasta or chickpeas (and for me, cookies!). I love this recipe and have 2 upcoming chickpea salads to post. So yummy! Dana, I think your photos are just lovely, and that they do the dish well. I make “chickpea” stew often – we are HUGE fans of chickpeas over at Chez. I am dying for the dry farmed tomatoes to start showing their smiling faces, so I can slow roast some as well. I usually don’t add garlic, but am going to use your recipe next time I start roasting! I think this looks delicious. But what is the green stuff chopped on it (as the recipe states “dried oregano”? At first I thought it was chard, finely chopped. Last year we made a few batches of oven-dried tomatoes (ala Orangette) and stuck them in the freezer. I think we had 4 half-pints and I definitely want more this year. They were the best to brighten up dishes in the middle of the winter. However I didn’t cover ours with oil, which made taking just a few out at a time easy. First of all. I LOVE the photos. Don’t want to hear any ifs, ands, or BUTS about that. The end. Second of all. This has all of my favorite ingredients in one place. Especially slow-roasted tomatoes. Those things are fabulous. looks yummy and healthy after my indulgent bkfst of waffles at a work breakfast. Looks amazing! Could you clarify the baking times for the tomatoes a bit? Is it ~45min, then another hour, then another 2 hours, for about 4 hours total? Michelle, it’s actually chopped mint. I thought it looked too monochromatic for the photo and I didn’t have any parsley. We actually liked the flavor of the mint so I will amend the recipe to reflect the garnish. Yes, according to the recipe, it’s 45, then an hour, then another 2. I did not bake mine for nearly as long, as I said in the post, so I’m not sure if that is actually way too long or what. If someone makes them, will they report back and let us all know about timing? This looks fabulous, looking forward to trying it! And your pictures are great! I had to laugh, I just got a new Nikon for my birthday and I’ve been trying to get the hang of photographing my recipes, much to my husband’s dismay when we’re about to dig in. Thanks for making me smile! Joining the rest here in saying, I love your photos! But I know how you feel. I constantly think, I could post this recipe if it weren’t so dark and I could actually photograph it, or screw it, I’m too tired to whip out the camera, let’s just eat! Each post is truly an accomplishment, and I so love yours. 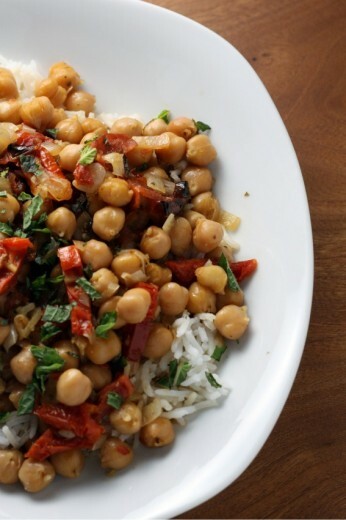 I’m always looking for new ways to make substantial meals with chickpeas, this is great. PS: I have almost finished the jar of peppers! I can’t stop eating them, and neither can my mother. For lunch lately I’ve taken really good toast, smashed some avocado on it, and topped it with a little lemon, sea salt, and peppers. Absolute heaven. I will be buying a case :). I too am at peace with my not-great-but-basically-acceptable photo skills. However, this meal looks great and something I’d probably keep on hand as a weekday staple. Though I might skimp on the time needed to bake those tomatoes as I’m so impatient! That sounds lovely Dana, but alas I would be in the same position with the tomatoes, but only because I wouldn’t have enough room in my built in fridge. My family knows not to stick a fork into anything until the camera is put away. I can hardly wait to make the tomatoes, they are gorgeous here right now, and I have been a canning fool. I like this with no pressure cooking! Thanks for making the mistakes so we don’t have to! Looks like another on my list to try – I wonder if I could stick a bit of spinach in, I let a bunch self seed in my garden and it’s everywhere. chickpeas are my favorite..love, love them! I think your photos are fantastic, but I too suffer from feelings of photography inadequacy! It’s fun anyway! Your photos always look nice and the food always looks amazing. I’m thinking this sounds good for dinner as soon as the humidity goes down here and I can turn my oven on…I’m looking forward to making it! I am a newbie to taking pictures of food. I think your pictures are great! I love chickpeas! I usually use them for homemade hummus. Sometimes I just throw them into soup. Thanks for another idea! I just gave you a shout out on my blog because your ccc cookies look so perfect! I am sure this dish is delicious; I just made a traditional chick peas and eggplant dish and I know it is going to look like a porridge, but the taste is great! Tough is it not? I love it when a nice, simple recipe takes you by surprise like this. Roasted tomatoes, roasted garlic, and lemon sounds like a fantastic combination here. And, are you kidding? Your photos are always great! First of all, I think the photos are terrific, but I know what you mean because people tell me they like my photos and I am always the most critical person. 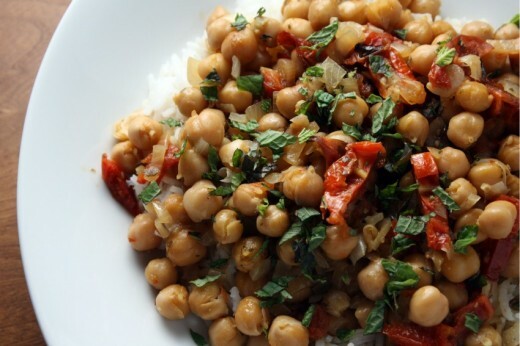 The chickpeas are just begging to be prepared and eaten – this is a great summertime recipe. Made this dish this weekend for the fam and it was a winner for sure. I did double the recipe and can confirm both that the leftovers were delicious and that the nearly 4 hours at 250 degrees made for some perfect tomotoes. Also, even after the doubling of the recipe I had some leftover tomatoes and lots of leftover garlic so last night I toasted some wheat bread, buttered both sides, sliced half an avocado, layered on some of the roasted tomato and a few roasted garlic cloves and ended up with one of the best sandwhiches I have ever eaten. I haven’t been on your blog in so long…but don’t take it personally! I haven’t blogged or been reading any blogs in the last few months…blame it on it being my first year as a working mom. But I will say this–your photos are great in my book. In fact, it was the picture of the chickpeas that first caught my eye and made me read this post. Your blog is my very favorite of all the ones on my blogroll! Hello! This is my first time commenting on your blog, but I’ve loved reading it for several months ever since my sister-in-law, Deanna, introduced it it me (she’s taken a couple of your classes recently). On the day you posted this recipe, I just happened to be looking for a dinner recipe to use up some chickpeas, and your recipe saved the day. It was so delicious! I took the extra effort to make the oven-dried tomatoes, and I think they are what made the dish shine. Thanks for the great recipe and keep up the good work! 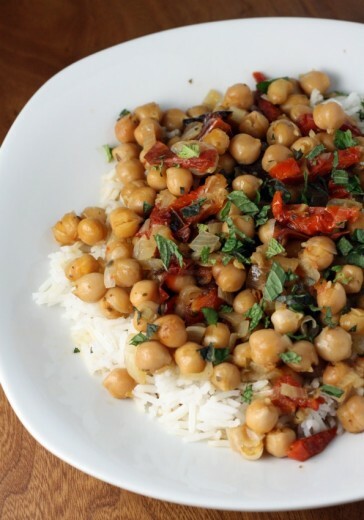 I love finding new delicious chickpea recipes and this one sounds like a really good one!